For the genre, see Category:Pinball. It's hard to capture the magic of a pinball machine in a video game. It was even harder in 1984 given the limited processing power of the Famicom's 8-bit CPU. But Nintendo managed to do the job quite well. 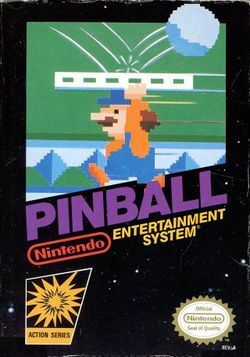 Featuring two halves of a table and an arcade style bonus round, Nintendo's Pinball pulls the player in, teasing them with tempting targets that seem just out of reach. Make it to the bonus stage, and you're treated to a little cameo of Mario and Pauline from Donkey Kong. Just when you think you've discovered everything the table has to offer there's usually one or two surprises hidden for you to find later on. 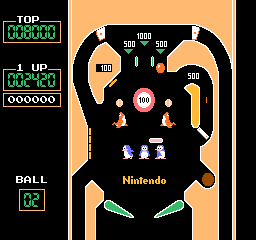 Pinball was the eleventh game that Nintendo released for the Famicom. The NES version was one of 18 launch titles in North America. Its success led to its inclusion as an unlockable game in Doubutsu no Mori (Animal Forest) for the Nintendo 64 and Animal Crossing for the Nintendo GameCube, as well as an e-Reader version called Pinball-e. In game: Push the D-pad in any direction to activate the left flipper. Bonus stage: Push the D-Pad left or right to guide Mario beneath the pinball. Press either the A or B buttons to activate the right flipper. Press and hold the A or B button to pull down the plunger and release the button to hit the ball. After you launch your ball by holding and releasing either the A or B button, the ball shoots up the alley to the top half of the table first. Keep the ball in play with your flippers by pressing the direction pad in any direction to activate the left flipper, and pushing the A or B button to activate the right flipper. There are a variety of tunnels and lanes to send the ball through. Starting with the upper left corner of the table, there is an alley with 8 lights that turn off when the ball rolls over them. If you manage to turn off all 8 lights, the seals around the center bumper begin bouncing a ball on their nose 20 times, giving you a 2000 point bonus. Directly adjacent to that alley is a target with a number above it. Every time you hit the target, you are awarded the number of points shown, and the number increases by 100 to a maximum of 1000. Losing a ball, or turning off the 8 lights will reset the number back to 100. On the right side of the table, if you get the ball to travel through the green alley, the three cards beneath the pink platform will begin to rotate. Every time that you hit the platform while it is over a rotating card, the card will stop and it will either be a 3, a 7, or a penguin. If you get all 3s, you will earn 3300 points and a stopper will appear between the flippers for 6 seconds. If you get all 7s, you will earn 7700 points, and the stopper will appear for 14 seconds. If you manage to get three penguins, the stopper will stay for an unlimited amount of time, and all of your points earned will double. You will lose the stopper if the ball drops down to the bottom half of the table, or if you send the ball through the green alley again. Finally, there are four targets on the left side of the table which give you 100 points for removing them. After you remove all four, they will return if you send the ball through one of the lanes above the center bumper. 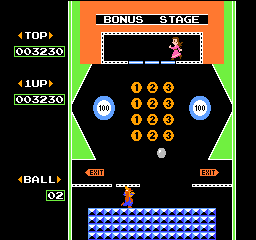 The hole in the lower right corner is where the ball is returned to play after the bonus stage (see below). Also, if the ball is in the top screen and enters this hole, it will be immediately propelled out of the same hole on the top screen. Once the ball drops down to the bottom half, there's still plenty of scoring opportunities, and even chances to return the ball to the top half. Along the top of the screen are five cards which, when turned over, display a royal flush. The cards will turn over when the ball passes through the lane beneath them. When all five cards are flipped, the color of the table changes to yellow and a stopper appears between the flippers that will not go away until the ball leaves the bottom half of the table. Directly to the right of the cards is a hole that leads to the bonus stage. It's very difficult to intentionally send the ball to the hole and it is most often the result of a random bounce. Along the left side are seven numbered targets. If all seven are hit and removed, the pink gate back to the plunger on the right side is removed. You can send the ball back to the plunger and send it back to the top half, but the gate and the targets will return if the ball passes through the lanes on either side of the lower pink bumpers. Last but not least are the eggs between the pink bumpers. Hitting an egg with the ball causes it to hatch in to a baby chick. Hitting a chick makes it disappear. And hitting the empty space where the chick used to be brings back the egg. If you manage to make all three baby chicks appear at one time, two stoppers will be placed on the far sides of the white alleys above the flippers, saving the ball from being lost if they travel down one of those lanes. However, they are only good for one use, and then they disappear. Make the chicks appear again to replenish the stoppers. Should you be lucky enough to maneuver the ball in to the hole in the upper right of the bottom half, the ball will arrive in the center of the bonus stage. Here you control Mario (Jumpman) who is holding a plate above his head. You can direct him left or right as far as the beams on either side of him will allow him to go. Up above is Pauline, trapped in a cage by three blue barriers. The ball will bounce around the room and roll over the 1s, 2s, and 3s that are contained in colored circles. Every time the ball rolls over a circle, the color of the circle will cycle from yellow to blue to red and back to yellow. When the color of all four of one digit's circles are set to same color, the corresponding barrier becomes a little shorter. When a gap between the barriers is made wide enough for Pauline to slip through, she falls to the ground. It is up to you to place Mario directly beneath her so that she lands on the plate he carries, and then direct her to one of the exits on either side of the screen. You keep the ball in play by preventing it from slipping down the sides at the bottom of the screen. The ball will bounce off the plate that Mario carries, but it may also bounce off the blue platform that he stands on if the ball is moving fast enough, so the ball does not necessarily go out of play if Mario misses the ball, only if it slides down one of the sides. If the ball falls down, the ball is returned to play from the drop hole in the lower right corner of the top half of the table. If Mario misses Pauline as she falls down from the cage, or if he fails to safely deliver her to one of the exits, the player loses a ball and is ejected from the Bonus stage. An extra ball is given after 50,000 points. After 100,000 points the flippers on both the top and bottom screens become invisible. After 150,000 points the flippers return. If the player manages to turn off all 8 lights in the upper left corner of the top half of the table, the table and the ball change color, and the seals which bounce the ball on their nose turn red, as shown in the picture to the right. The score indicator and number of balls left are given a fancier font. A bonus score is also tallied throughout play and granted to the player when the ball goes out of play. The drop hole in the bottom right corner of the top half of the table does not kick the ball back out in to play, but rather ejects the ball from the hole in the upper right corner of the bottom half (the hole which leads to the bonus round) which generally makes it more difficult to keep the ball in the top half. In the bottom half, if all three yellow chicks are displayed and the side stoppers are present, the player can then rotate back to the eggs and hatch pink chicks. If three pink chicks are revealed, the player is granted an extra chance after the ball drops below the bottom half. A red ball with wings will float up between the three center bumpers and revert back to the silver ball. This page was last edited on 7 March 2018, at 18:41.